Why is it so hard to find bedding?! Our new bed is here!!! I swear I’ve never slept so well! With the new (giant) bed in, and our old queen size mattress out it’s time to decorate. 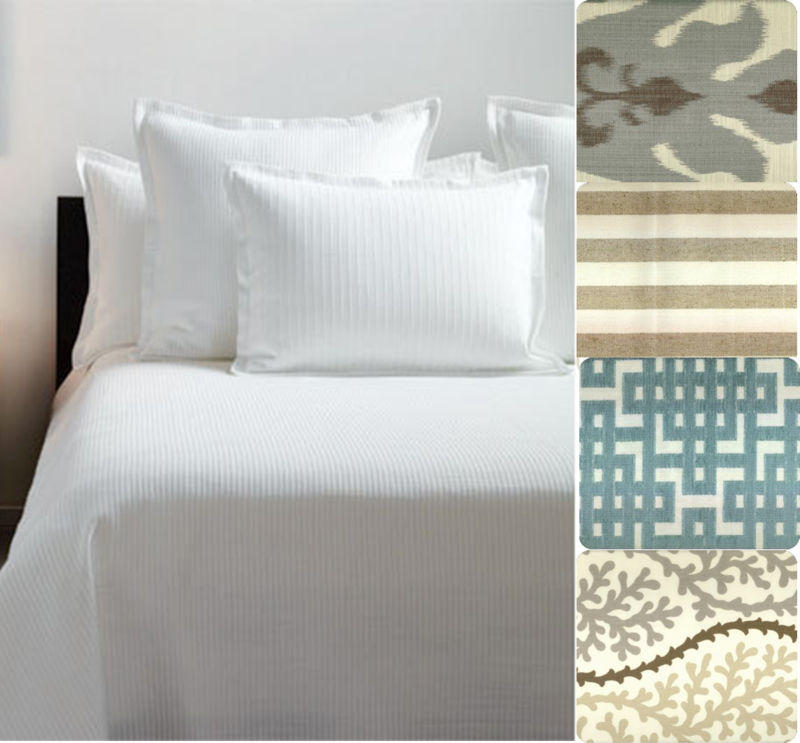 A few updates since my last bedroom post… remember these two bedding options? Well both of these are off the table! Yes, OFF THE TABLE. I thought I was ahead of the curve when I ordered a few options before the bed arrived. Well life is never THAT easy. Dah!! Damn online shopping! Apparently bedding is one of those things you have to see and feel in real life. Option I ended up being very “shiny”. There was metallic threads woven into the comforter, which ended up making it look (and feel) really cheap. The pattern was pretty, and the colors were exactly as pictured, but it felt like some awful polyester blend. Woof. Option II was pretty, but it didn’t have the loft we were looking for. Kris also felt the embroidered quilt was way too feminine. Can’t argue with him there! Now I’m on the hunt for a duvet – I’m picking up a fluffy down comforter after Christmas, and with so many duvet options, I’m back to the drawing board!! 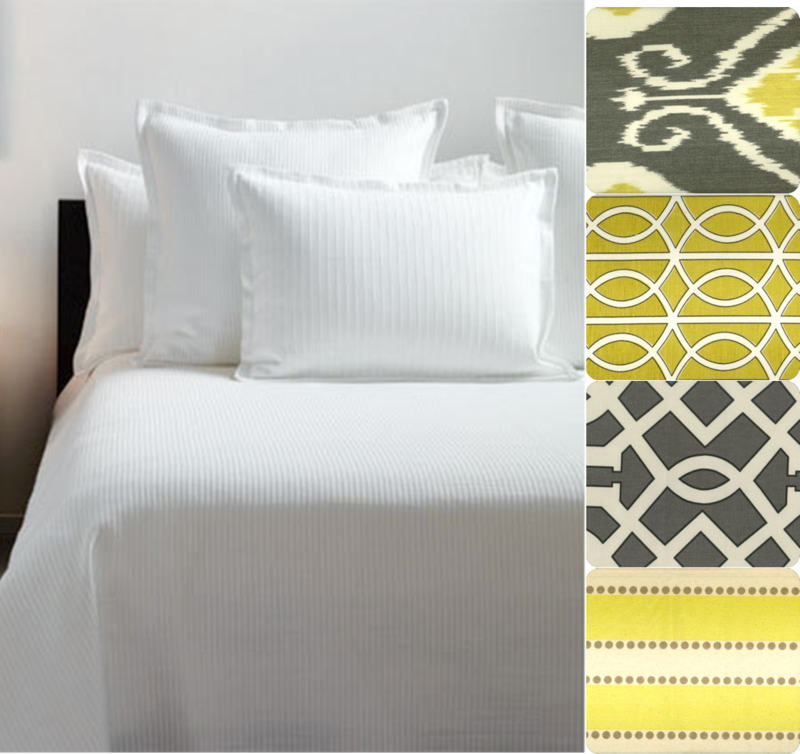 We’ll definitely be sticking with light colors since our room doesn’t get a ton of natural light during the day. 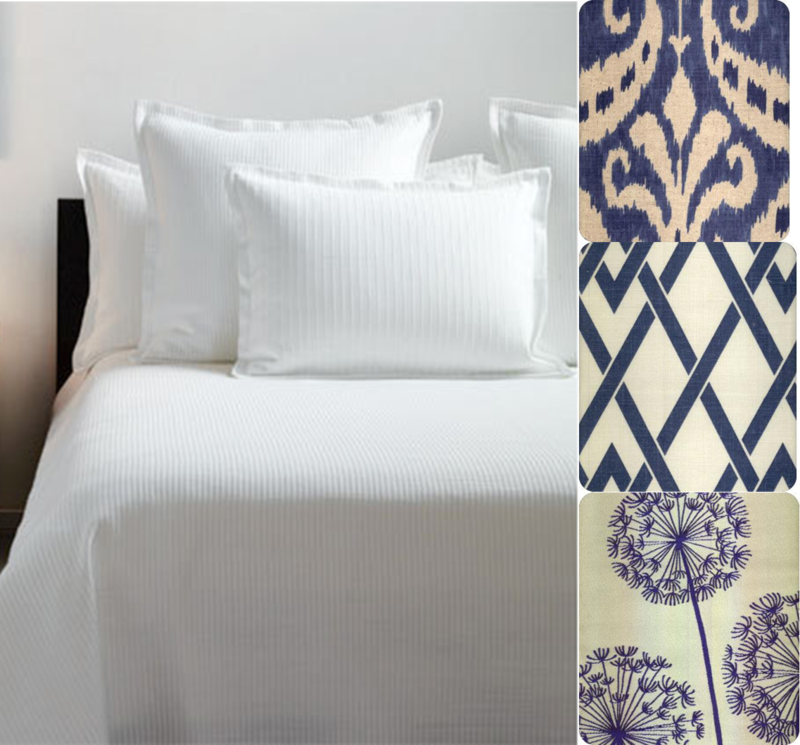 Moving on… I am still into the look of “hotel” bedding – a la Restoration Hardware. This bedroom uses part Barbara Barry Poetical, and part Restoration Hardware Hotel Bedding, with a headboard eerily similar to the one I’m about to attempt… fate? Clearly, I am totally lost and have no clue which direction to go with for bedding… so frustrating! This entry was posted in Bedding by Simply Styled. Bookmark the permalink. I received the poetic bedding as a bridal shower gift and I will say I do love it. 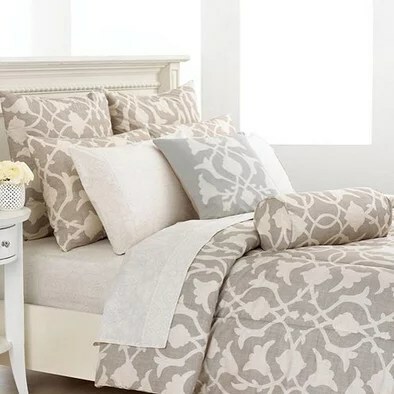 To add some color in my neutral bedroom (taupe, cream, fawn) I add splashes of color with sheets or throw pillows on occasion- this way I can change them easily without spending a fortune. I love the set with dark purple/eggplant sheets, or even navy too. Good luck with your bedding hunt. do you know fabric names of the last inspiration board? Unfortunately I don't see the fourth fabric from this inspiration board either – looks to be discontinued. 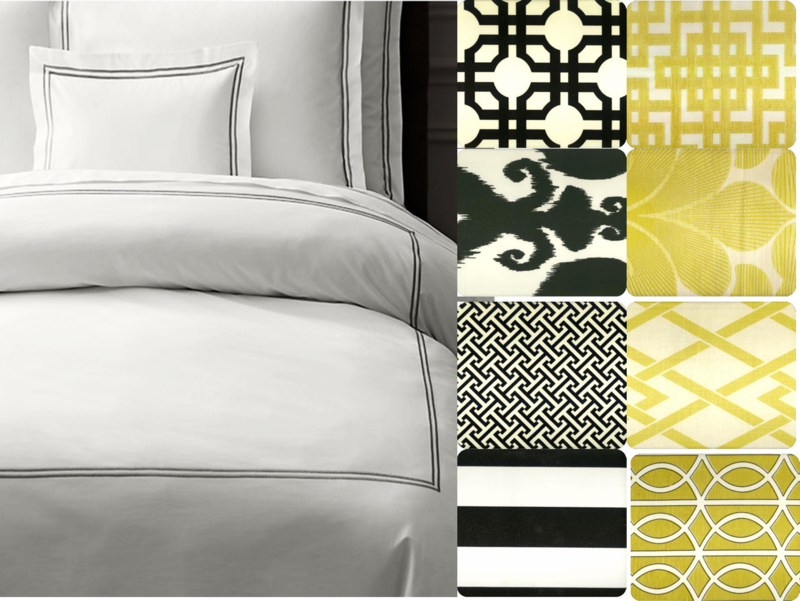 Lewis and Sheron Fabrics have a ton of other great options thought – you should definitely check their site out!